So rather the the flight club be a thread for flight searching. It is clear that it would be a good thread to pool questions and knowledge on other threads. Somewhere south (EXT, BRS, CWF, LHR, LGW) > Avoriaz, 24th March to 31st, 1a, 1cb, 1ski. I reckon best is Swiss from LHR>GVA then Skiidygonzalez (with the code posted the other day). Flight times are crap but it's cheap. Would consider a bit more for more convenient flights. I'm not entirely sure what help you are looking for but would recommend Sky Scanner for any flight booking queries. @bar shaker, a cheap flight/transfer from any of the airports listed. Isn't the point of the thread to get suggestions from people that I may not have thought about? Basically I want to get from Exeter to Avoriaz as cheaply as possible and, preferably, not have to get up in the middle of the night. Ive looked myself and the only budget option I can see is Swiss, but flight times aren't ideal. If any helpful Snowheads can suggest an alternative that is a better time but isn't much more expensive then I'd be grateful. I think @GlasgowCyclops, is offering help with finding flights, rather than asking for help. @intermediate, I think @bar shaker was replying to @SnoodlesMcFlude not@GlasgowCyclops. Another really easy way of searching for flights is Google Flights which allows you to store planned routes and monitor price changes. Rules are. No chit chat. So, let me get this straight, the first rule of flight club is you do not talk about flight club? I'm not sure that this is going as @GlasgowCyclops planned Either that or I've got the wrong end of the stick. I thought the idea was that people would post about where they want to go (and when) and the sH community (at least, those who enjoy googling flights) would offer up options. Transfer with Skiidygonzalez (use code 'PowderPlease') for £90. Flight times aren't the best but price is good and transfer is shorter than going to Chambery etc. I have previously suggested a separate travel and transfers sub-forum. Currently all such options clutter up the timeline of the others, but I still think a request, unless the title of Flight Club is more self-explanatory, should be an individual thread, otherwise it is too easy for it to become lost in other people's requests. Oops, miss-read the title as Fight club, thought I would find the usual suspects in here. @Dr John, those websites need to be fed information though (if you mean skyscanner etc). If you live somewhere that it's not straightforward (e.g. Just checking London airports) then those sites work great. But for those of us that are further afield you might not have thought about all the options. For example, I hadn't thought about checking Cardiff until someone suggested it yesterday. Likewise I was looking at landing in GVA but someone suggested Chambery and having the longer transfer. That's for a simple trip, if you're looking at a more involved flight then I think the idea of putting it out to other Snowheads is a good one. @Dr John, doesn't really work either, given that I'm not overly interested in flights from Luton, Southend, Liverpool, Manchester, Newcastle, Edinburgh etc. @SnoodlesMcFlude, perhaps not, but it does list Cardiff. @SnoodlesMcFlude, if you use Google Flights you can put in an airport then click the + symbol - it will then bring up a list of alternatives which you can click to add to the list of possibles. @Alastair, that's neat (there used to be another site I used that offered that but skyscanner doesn't for some reason). There are websites like skyscanner. Great. But you try and search for a flight from Gla, edi, inv, Ncl, man and you will be clicking away all day. Also forcing a club in one direction is tricky because many of these sites want you to do club in both. Also doing an open jaw or a positioning flight ex EU etc etc etc. Just like some on here can offer advice on skis, some can offer some advice on flights. E.g. Today I sorted my options for Gla-Lhr-icn as an open jaw with return via Hkg and a separate pnr from icn to PVG and a separate from PVG to Hkg and saved about £1700 on the round trip. An example going to the USA and Canada is that flying via London from Dublin, Oslo or Arlanda can save a lot of money and I'm not sure the average holiday flyer would know about this. Even Admin was amazed that his flight from Milan to Tokyo was cheaper than the rabbits from Heathrow. Or for £130 you can go on FRIday and return on Sunday. However, since the outbound connection in ZRH is tight (not for you but for your bags) you may want to go out on Friday evening. And this is an example of how SH can learn things. I use Matrix myself (the back end to Google flights and Kayak). Me too for a complex itinerary such as you have just booked (also an ex-EU flyer here!) but Matrix isn't the most user friendly piece of software and takes a bit of getting used to (I'm sure I'll get there one day). I find Google Flights is quicker and easier to use for simple short-haul comparisons. If you move the sliders on the LHS of the Skyscanner page, you can move your priorities. The problem with personal recommendations, is that they are obsolete in hours. I was looking at flights to Mallorca in May, for a friend's birthday. She announced that she had booked to fly from Sarfend, which is handy for us. By the time I looked at booking 4 hours later, flights had gone up by over £200 where as the STN option was still only £17 more than she had paid. The flight times are within 5 minutes out and rtn. So whilst we could keep GlasgowCyclops in full time employment searching for slight alternatives, unless you pressed the button immediately, the info would be obsolete. The other problem is that prime time flights aren't cheap and the longer you leave booking, the more expensive they get. No offence, but this is a massive waste of everyone's effort! 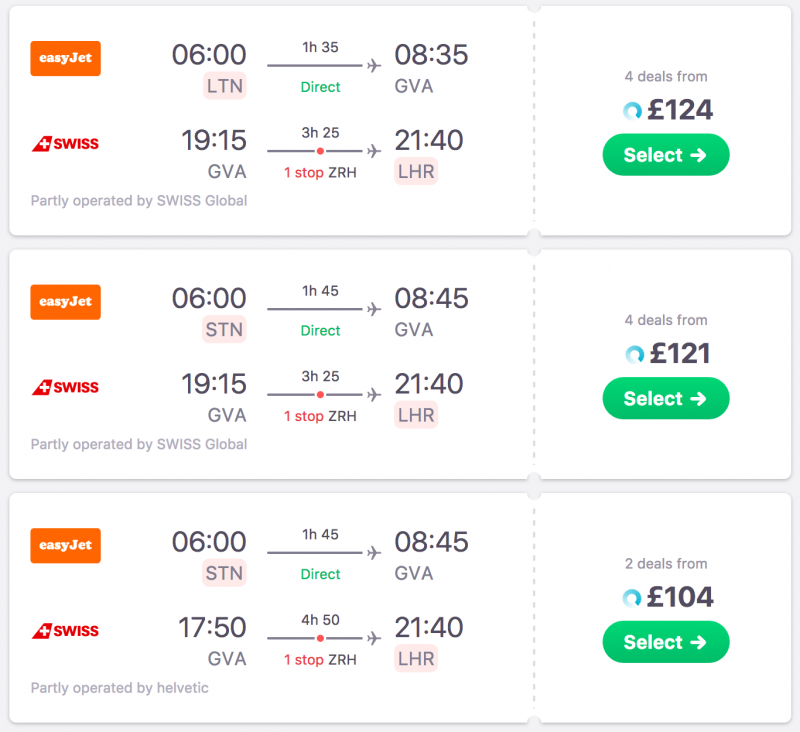 Most have remarked that the prices often change, but surely it's not beyond the skills of people to use flight comparison websites and look at the different date and airport options. @SnoodlesMcFlude If you can use public transport then flying out of STN or LTN and back to LHR is your cheapest option and has good flight times. Using the same airport show LGW to be your best base and this is about £100 more. Especially when you also factor in that some people will look to save every penny, even if it means multiple flight stops/aircraft changes and hours getting there and back, whilst others will want the simplest and quickest journey, from door to door. Far too many variables to make any meaningful recommendations on a bulletin board. Use the flight price checkers and play around with your own priorities... then book immediately when you find a deal that works. I was only posting as a 'test' and the Swiss flight from LHR is still the best option. @Badbobby, it's only using the time of those that want to help, no one is forcing somebody to look up flights for them and no one is looking up flights without being aware that skyscanner exists. As an aside, and ALMOST back OT, for, for example, bash flights - and I know you can't be a TO before goldballs gets his knickers in a twist - if you use "BA group booking" for 10+ seats, you get a substantial discount. Now my purpose for being on this thread becomes clear - transfers from Zurich to Ischgl for 10 - thinking 2x large vehicle hires (e.g. S-Max) . But anyone else got any other ideas? Really good point and idea. Perhaps this thread is not for the frequent flyers or even the people going from London to GVA. However, perhaps it would be useful for say a family of four going to the USA or Canada or Japan etc etc. Anyway, at the threat of this turning into another brexit-length thread about how I'm wasting my time. I'm not a TO and since most think I'm wasting my time and everyone on the internet can easily find fares themselves I'll see you all on the BASH pages where "No One Ever" asks for help with flights. As you say @GlasgowCyclops, this could be a valuable thread for people looking for beat value, which frequently isn't obvious or logical. I think keeping to general shared tips and ideas may be a good idea less this become the SCGB post2. I think it's a good idea as a thread, and I'm surprised that so many people are comfortable in their own ability to use existing tools to get the cheapest option. If you go more than once in a season from London airports, including school hols (any of us with kids!) then it is unlikely that the standard options (Skyscanner, google flights etc) are giving you the cheapest price. If you don't believe me, try me... give me your flights and price paid, and I'll see if I can beat it. E.g. I could book for Xmas/ny, Feb half term and Easter for £110 return per flight on average with bags LGW/GVA. you won't find that on Skyscanner! On the BA site if you choose Economy Plus the cost is £113.5 you can reduce that by £40 with 5500 Avios (earning 250 Avios in rewards) that works out to £73.50 cash and costing you 131.25 Avios per £ saved. Not sure all that makes sense or not. I should have said it is sometimes cheaper so check both and it depends on the level of AVIOS. EG my EOSB flights for two GLA-GVA. Looking for Avios redemption I looked at the flights and it was 31,000 avios plus £180 for two (£90 each) in economy. Going to a normal booking and using AVIOS to reduce the price. I was offered 28k AVIOS to reduce the total cost to £160 (£80 each).